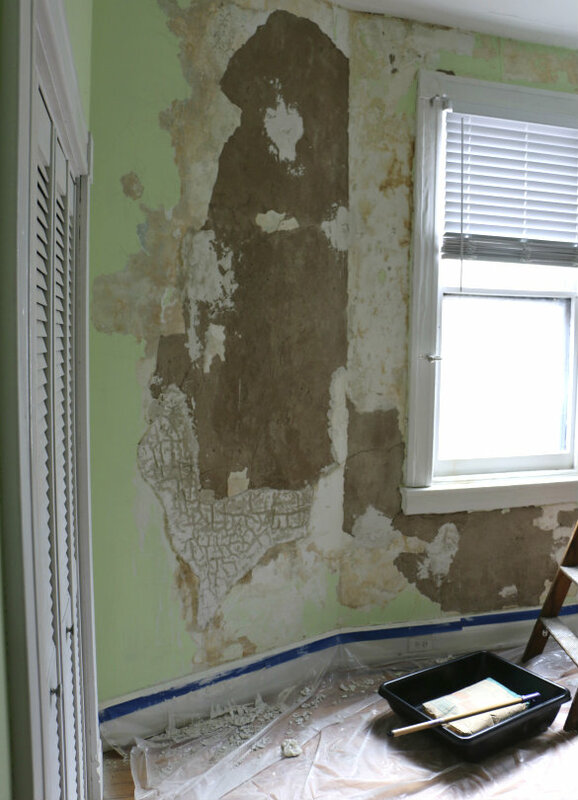 What started out as a simple painting update turned into a year-long set of home repairs after discovering there was a moisture problem with these exterior facing walls. 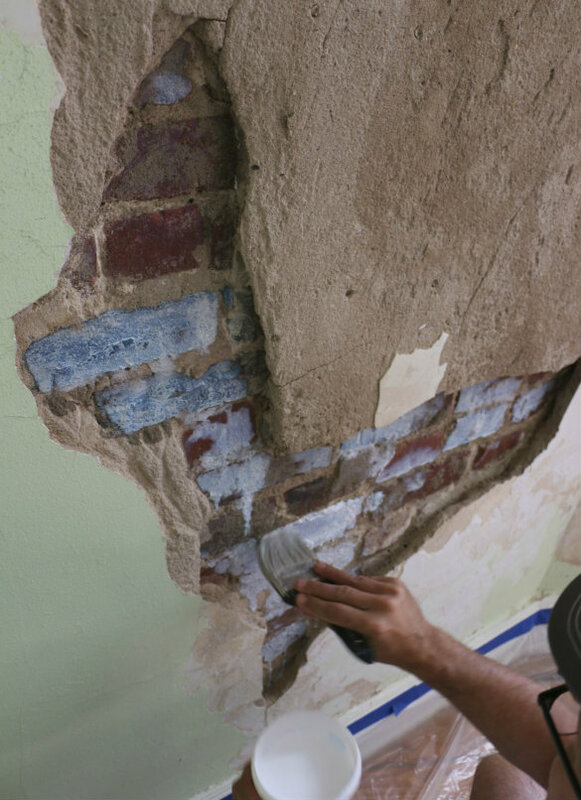 We ended up pin-pointing the moisture problem and fixing it with a combination of roof, gutter and brick repairs — the background on why the wall looks like this and how we fixed the moisture problem is all detailed out in this post. 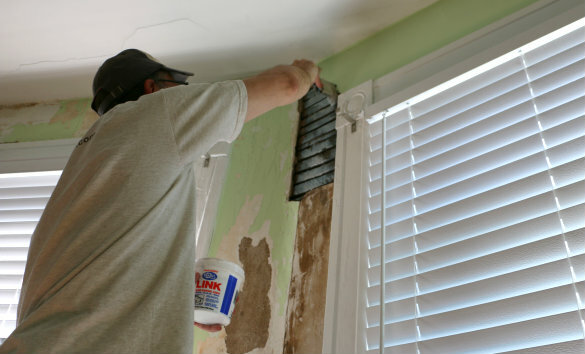 We hired trained professionals to take care of all the exterior work and in the months it took to get quotes and schedule those needed repairs, we had plenty of time to research what it would take to repair and restore the interior wall (since we couldn't tackle that until the moisture problem was fixed). 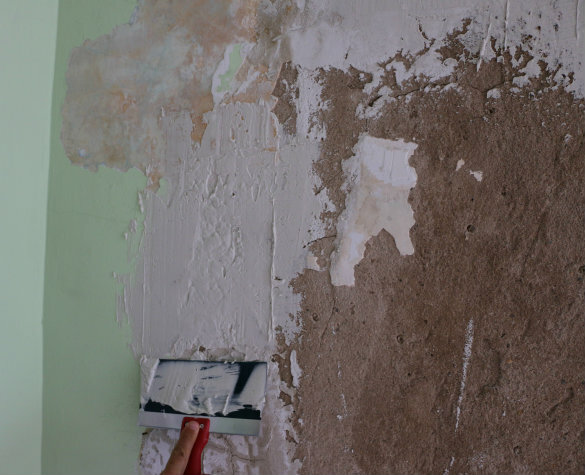 We originally figured we'd hire a professional to do the inside work too, just getting us to a point where we could then prime and paint ourselves, but after chatting with local wall specialists, hardware store experts and watching hours on end of exciting wall repair videos on Youtube, we decided to try and take on the interior wall restoration ourselves. 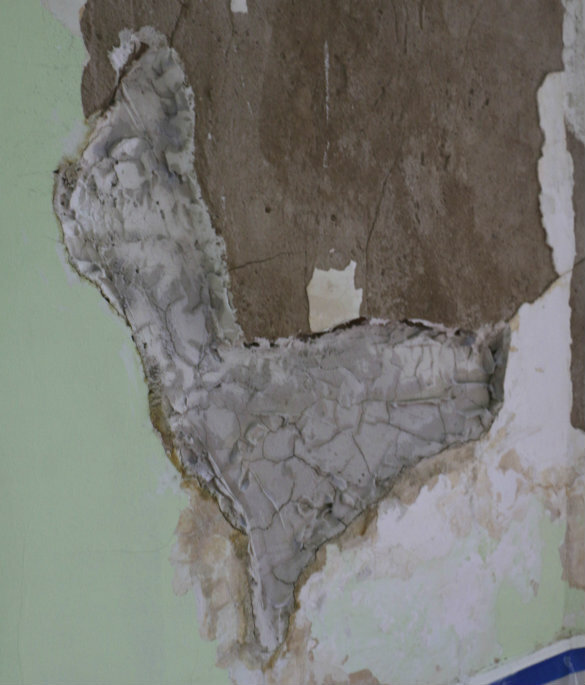 Today I'm going to break down each of the steps it took to completely restore this mess of a plaster wall we had above! The good news is, we're now on the other side of this project with smiles on our faces! 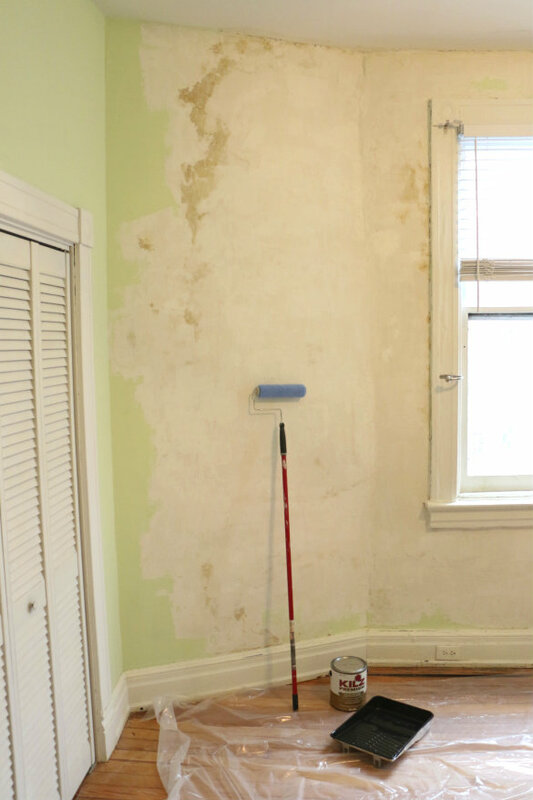 While it's a long (and boring) video to watch if not directly related to a project you're working to fix, we found it incredibly helpful to be able to watch exactly how these guys demo'd the walls and refilled them step by step until smooth again. It was this video that actually gave us the confidence to try tackling the restoration ourselves. Heck, if we didn't get it right, we figured we could try to contact them to come help us, ha! 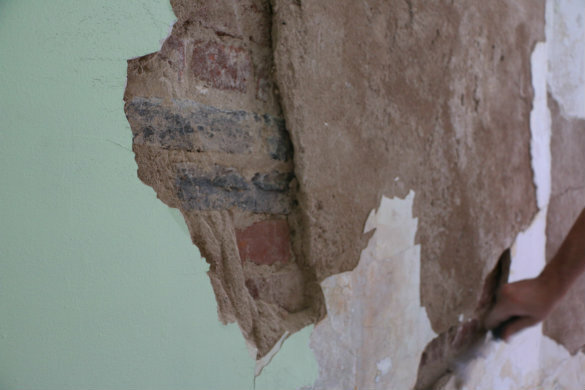 Outside of how terrible the wall looked, our biggest concerns were around making absolutely certain the moisture problem was taken care of. 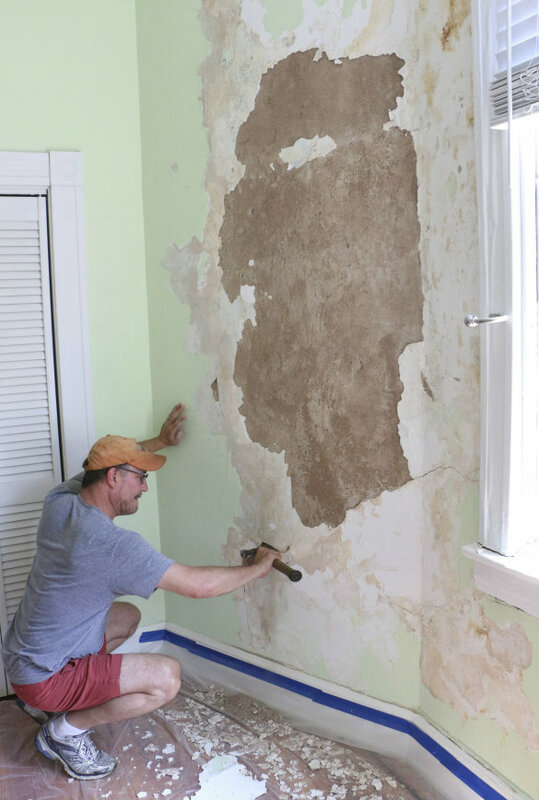 In the photo below, you can really see how the wall is dry with flaky paint, instead of the moist wall where we could pull entire sheets of paint off at a time. 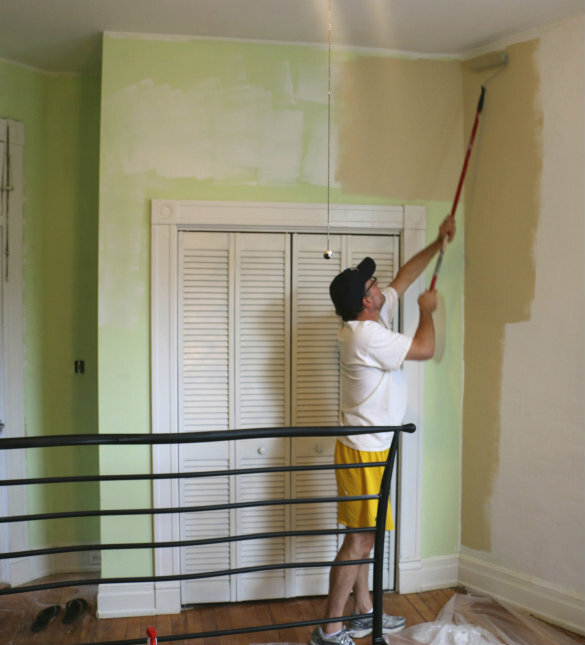 To get started, we prepped the room by lining the floor with a plastic clear drop-cloth and paint tape along the baseboards of the room. 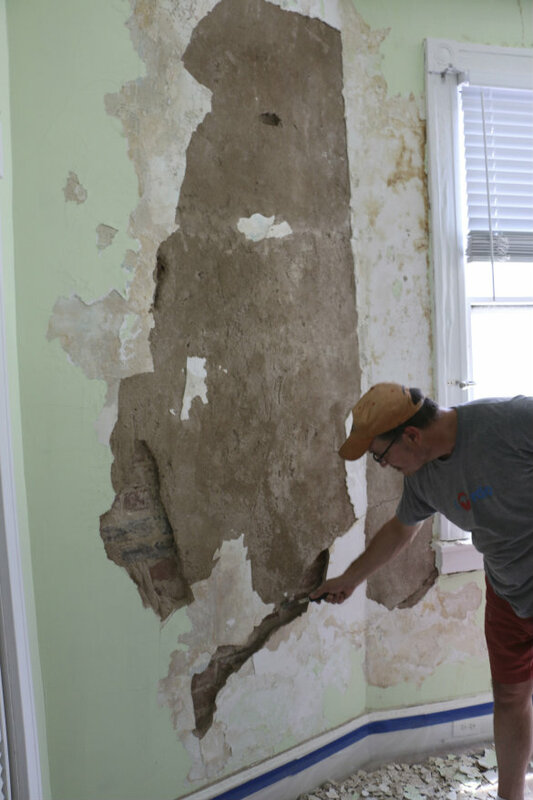 We knew there would be a lot of debris, wet sandy compound and dust that would ensue, so the ability to just wrap everything up in the drop-cloth after the fact was much more appealing than sweeping! 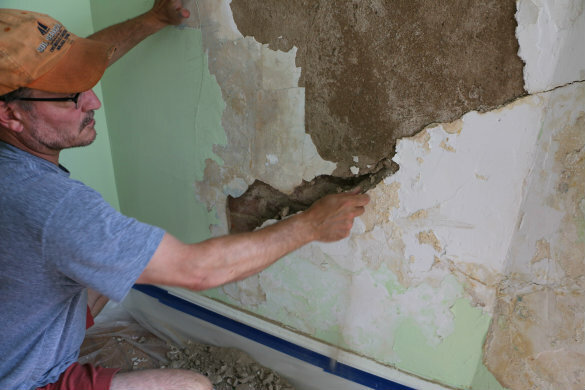 Oh and yes, I'm hammering the wall apart in the photo above. 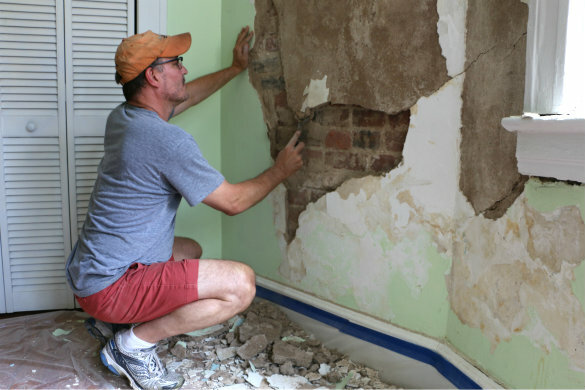 It might seem crazy, but demolition was actually the first step in repairing the wall. 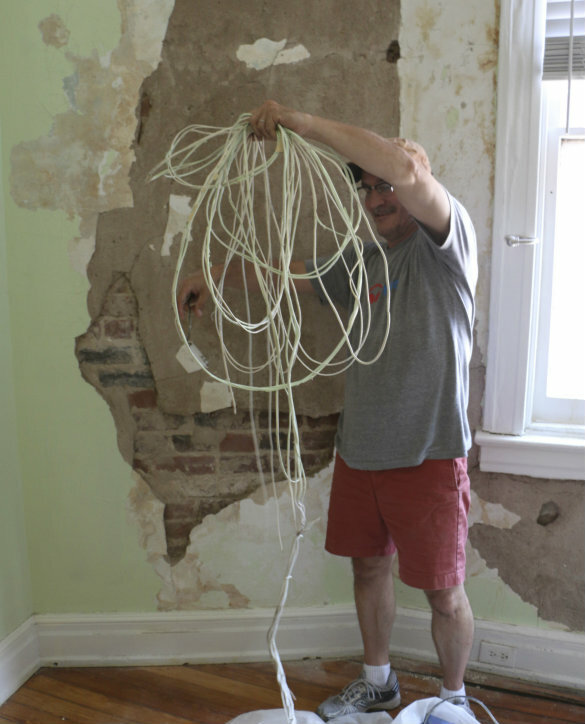 The goal was to go around and hammer out each of the weak areas in the wall, leaving the strong, undamaged areas in place. I have to admit, this step was both terrifying and extremely fun at the same time. 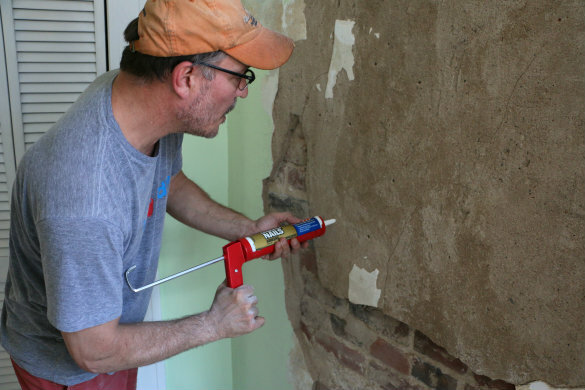 Terrifying in the sense that the idea of taking a hammer to the wall in our home could be a terrible mistake and fun in the sense that I was taking on a pretty major project that I never imagined being able to do myself. 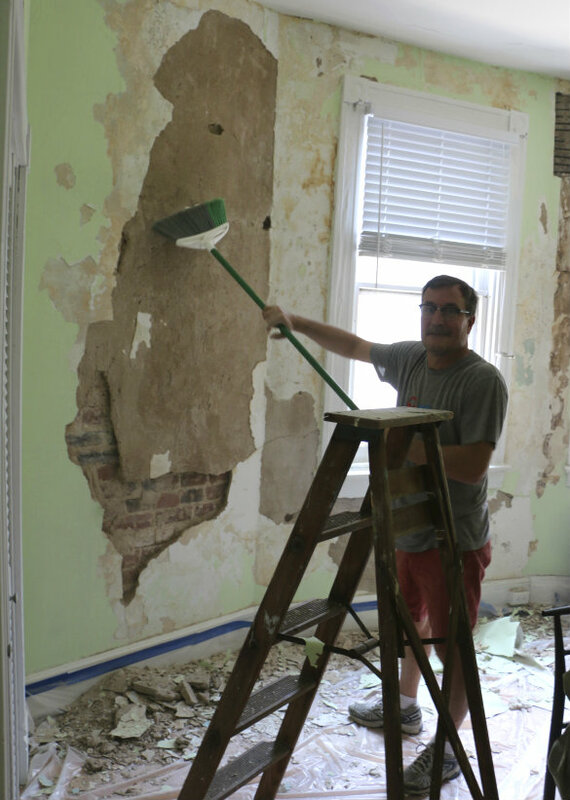 In the end we decided to just go ahead and repair the wall (not biting off more than we could chew), knowing that if we ever wanted to expose the brick in this room, that this section would be a great place for doing so. That's a nice collection of demolished wall we amassed along the floor there, eh? Yeah, it was definitely an adventure. 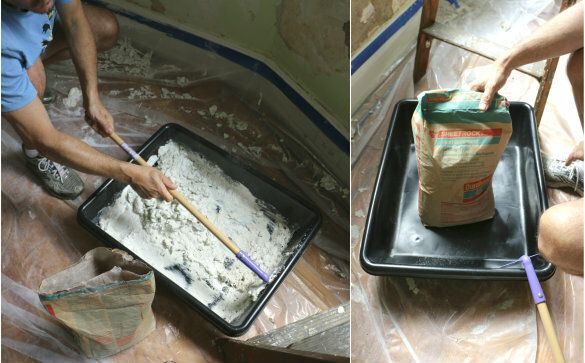 This stuff was new to us — it's a plaster basecoat that acts as a wall filler and insulator. 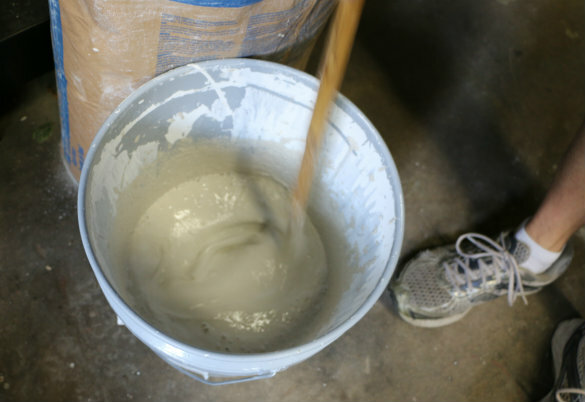 You just mix it with water to create a working mudlike material that conforms to the wall, helping achieve durability. 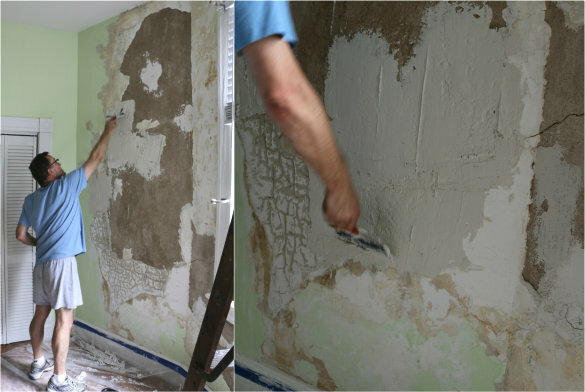 I was able to build back the smaller areas of the demolished wall with one application, but the largest areas required two layers to get a big enough build up in order to work with the final finishing plaster. 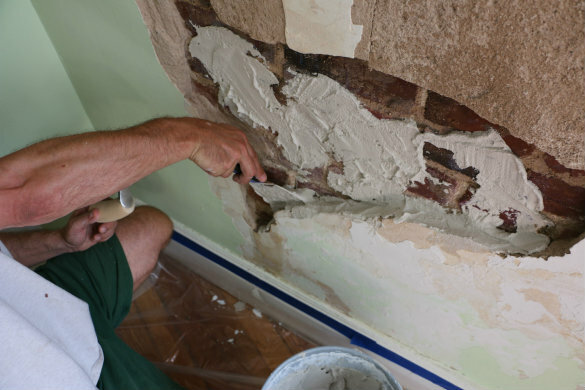 It was also another good breaking point to allow the basecoat to fully dry before moving onto the final stages of wall restoration. 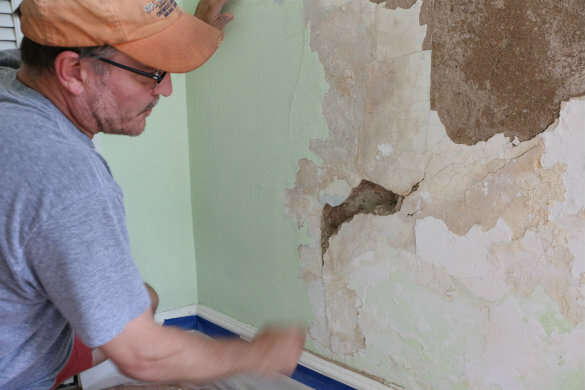 This stage was also a little more nerve-racking because I needed to try and achieve a perfectly smooth application since it would be the final layer on the wall repair. You can really start to see how the wall is coming back to life at this point. 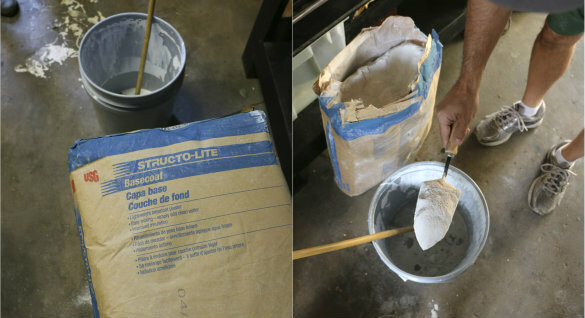 It was also another breaking point for me before moving on to the messiest part of the entire restoration — sanding. 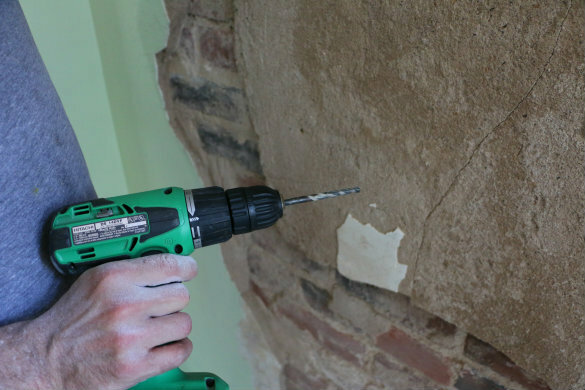 For smaller wall patch repairs, a good piece of sandpaper and a little elbow grease would do the job just fine. 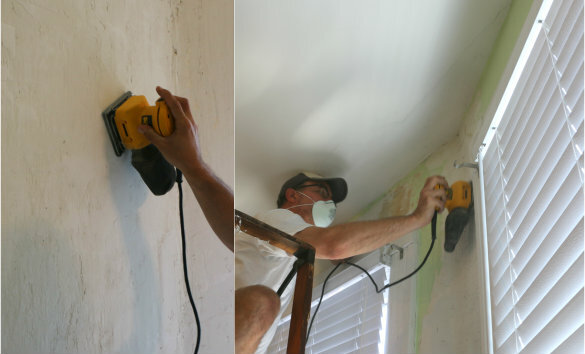 Since I was going over entire sections of wall, I opted for the electric hand sander to help speed up the process. 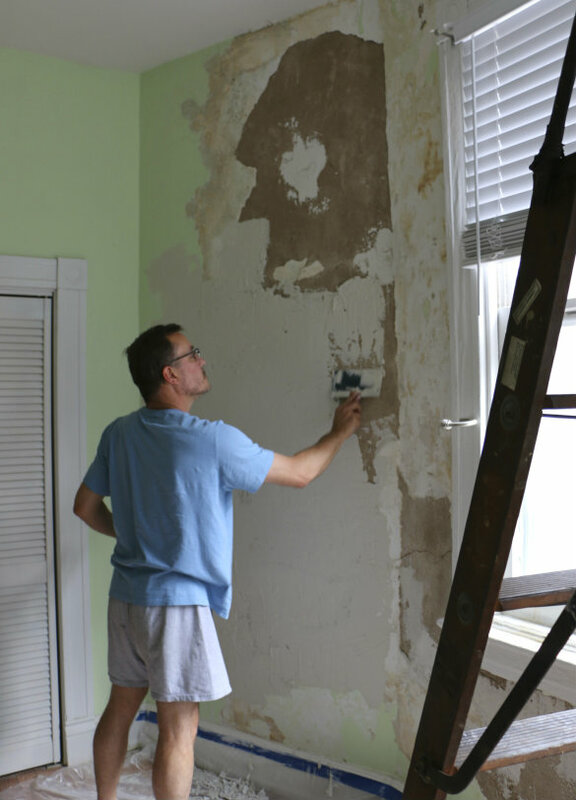 It's a good idea to make sure all furniture and decor is removed from the space you're about to sand, along with closing all of the doors — the dust particles that result from sanding are no joke and very tedious to clean up. And yes, that's a glass of red wine resting on the ladder there, what good eyes you have. 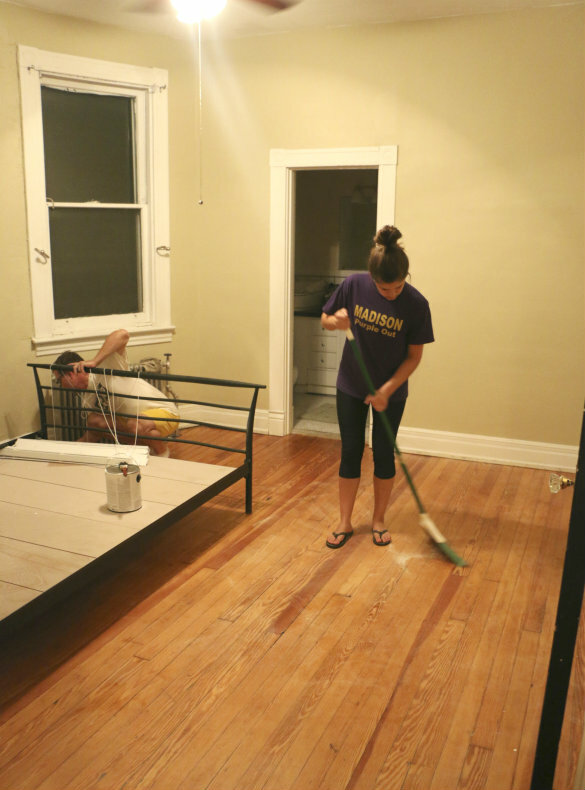 Since the painting portions of this project were an evening activity for us, Mary joined in and we cracked open a bottle, played some jazz and knocked out the rest of this room! 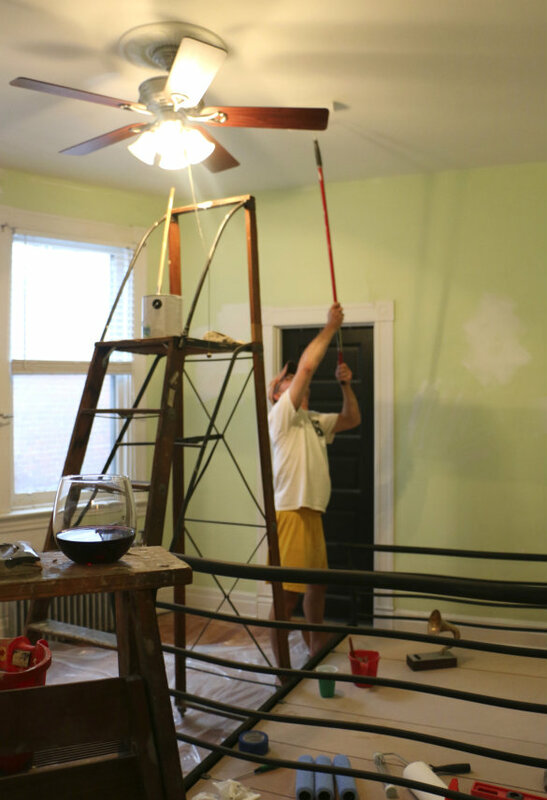 This was a momentous moment for us, since giving the walls in this room a fresh coat of paint was the original goal in this project (before discovering the water damage and embarking on a year-long repair schedule). 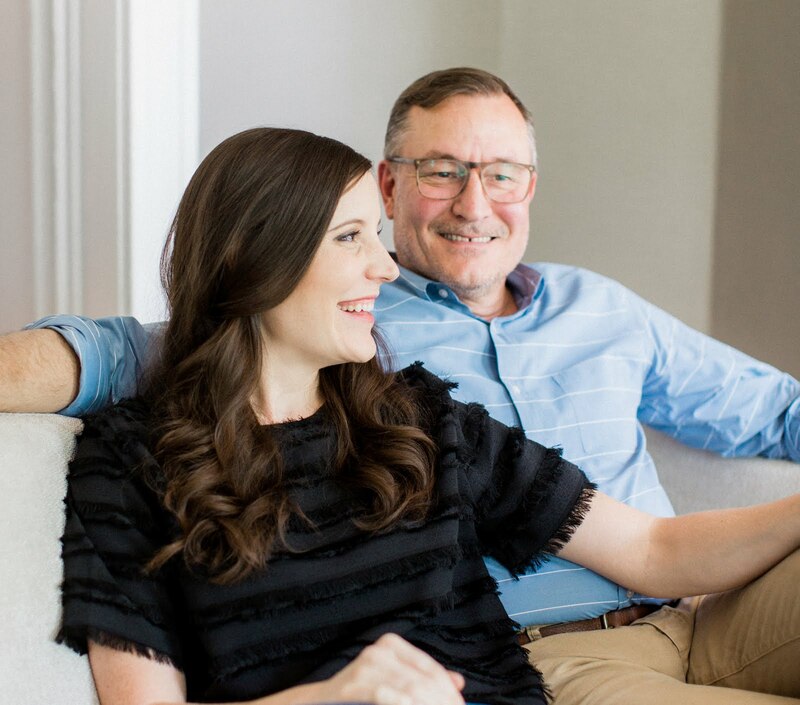 Stephanie had chosen Restoration Hardware's "Latte" paint color from the flax collection around this same time last year and we'd been storing the 2 buckets of paint in her closet ever since. 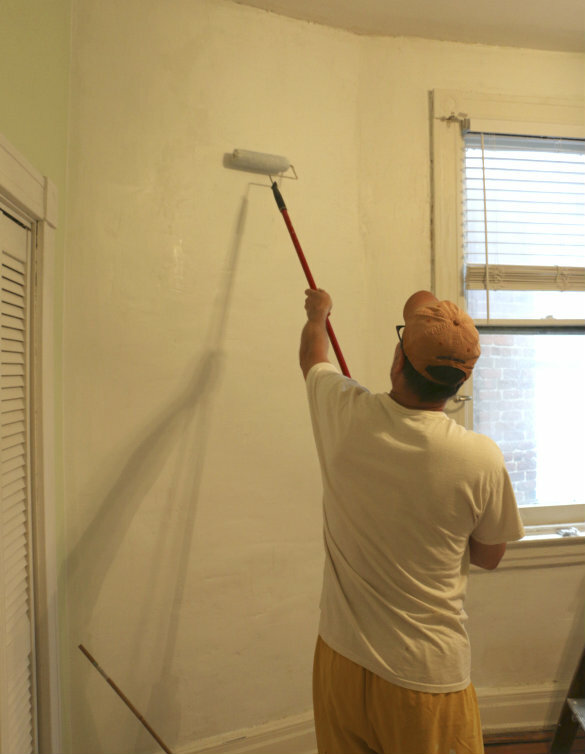 We're big fans of the RH line of paints since they always seem to nail great shades of color, but are also engineered for environmental safety, are odor free, mold resistant and provide amazing coverage — we're usually able to use two coats of paint without primer on normal painting jobs, which is why you'll notice some areas of the room (outside of the exterior wall) where I didn't prime with Kilz. 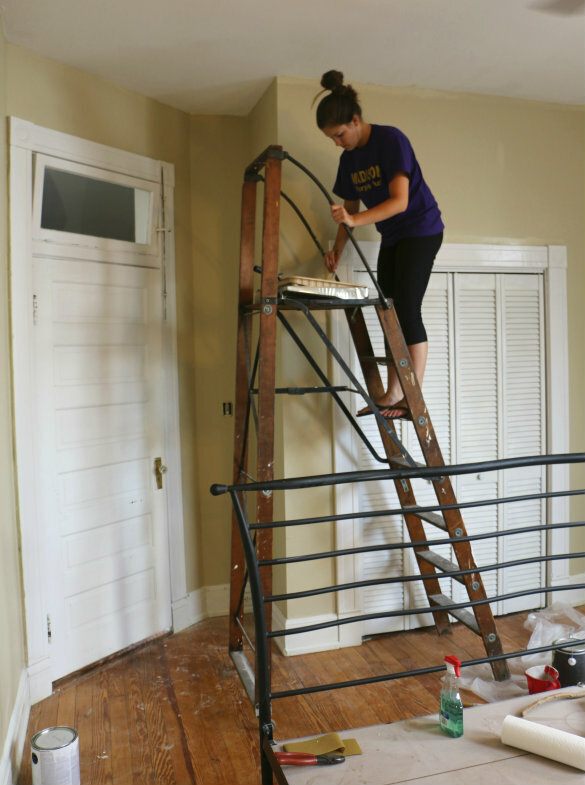 In typical fashion, I rolled the room while Mary worked to edge. Stephanie went around and detailed the entire ceiling perimeter. 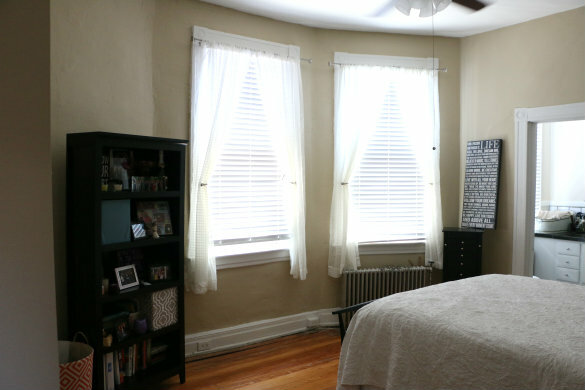 The whole time, we couldn't believe just how big of a difference the more neutral shade of paint made in this room — it's unbelievable. 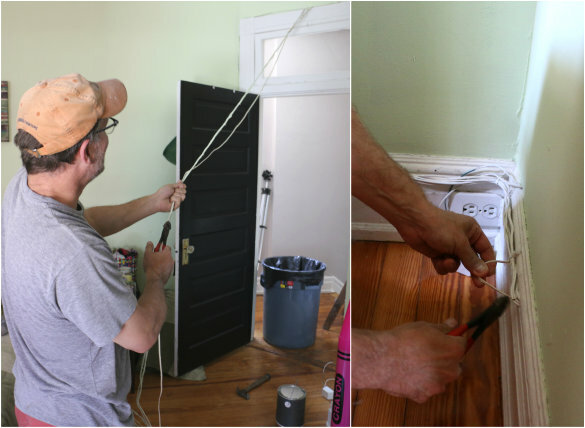 Once the paint dried, I went around and updated each of the receptacles with clean white switches and covers — as you know, it's one of my best tricks for updating and brightening a room down to the little details. Last, but certainly not least — final cleanup! 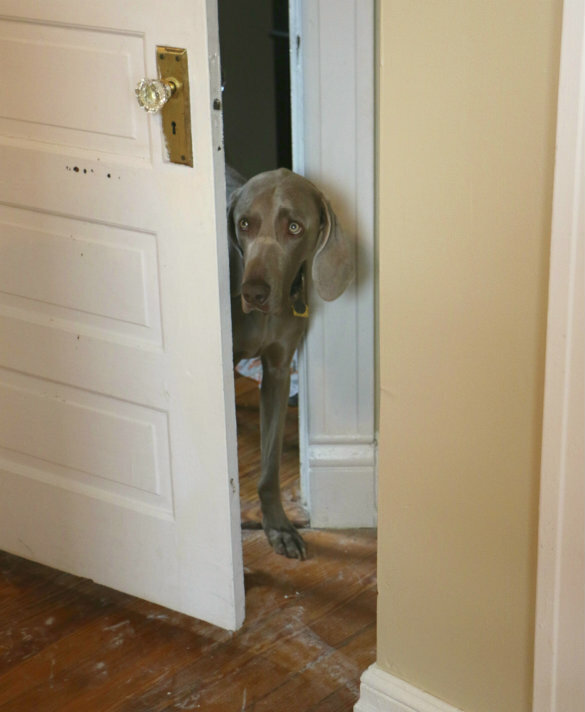 We did our best to wipe and sweep up every last particle of dust, but I'm sure we'll be uncovering it in this space for the rest of the time we live here! Whew! If you're still with us at this point, you deserve a blog-reading medal of honor. 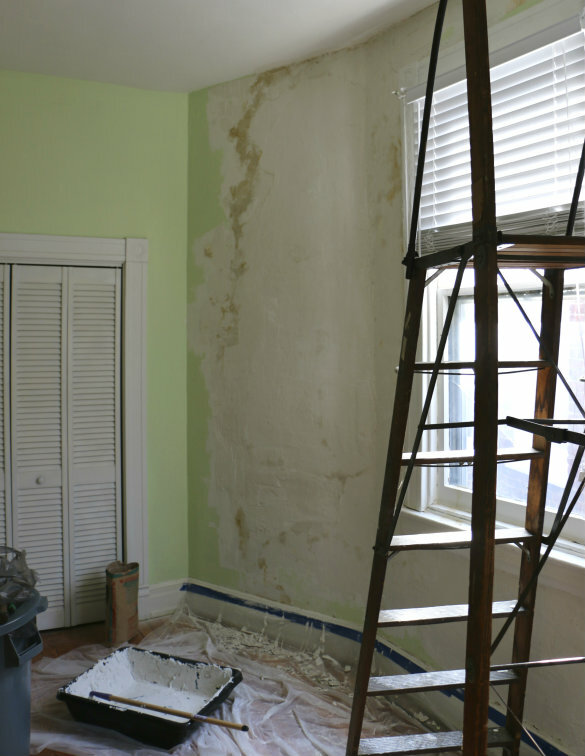 From this point, I called my portion of this wall repair and painting complete. Such a difference! You'll notice some bumps and bulges in the work I did, but I'm happy with the overall result and feel like some of it lends to the character of our old home. 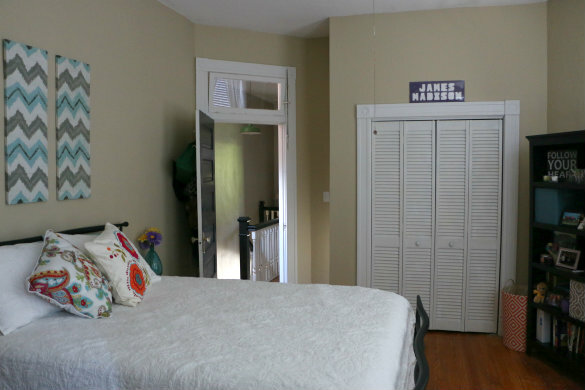 I have to admit, it feels like a huge weight has been lifted from my shoulders knowing not only is the room painted the way Stephanie wanted, but all of the root damage is taken care of. Like I said earlier in the post, it's also been a huge sense of satisfaction knowing I was able to do the interior restorative work myself — it's not something I would have ever considered taking on in my past life but am so glad we did. 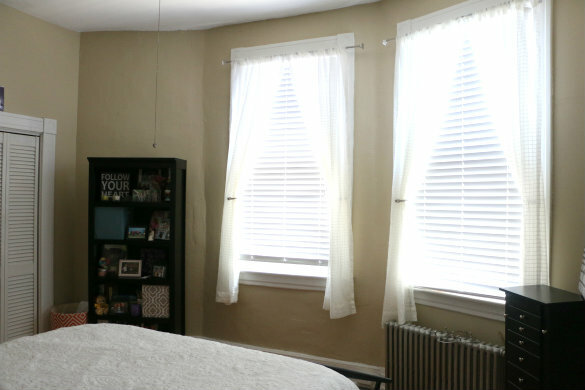 UPDATE: We've posted some proper "before & after" shots of Stephanie's room — check out the full transformation right here! well you should be proud of yourselves. Good work. 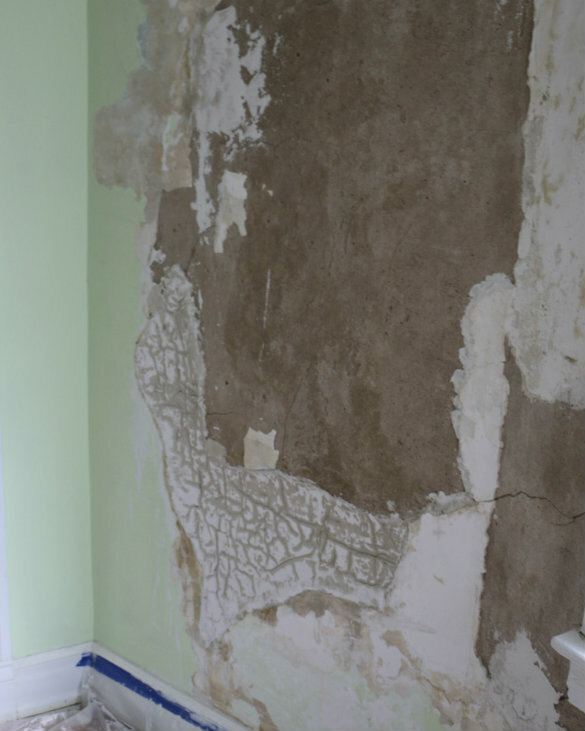 My dad was a plasterer all his working life, so I've seen this kind of chaos a lot. And not once have I ever wanted to try and do any kind of patching up! It looks pretty good to me. Your wine was well deserved! And you've saved oodles of cash doing it yourselves. Loving the new colour. Really pretty. Thanks Sadie, we are quite happy and proud ourselves. I would not want to to do this everyday like your dad. A new found respect for that profession! Great post! 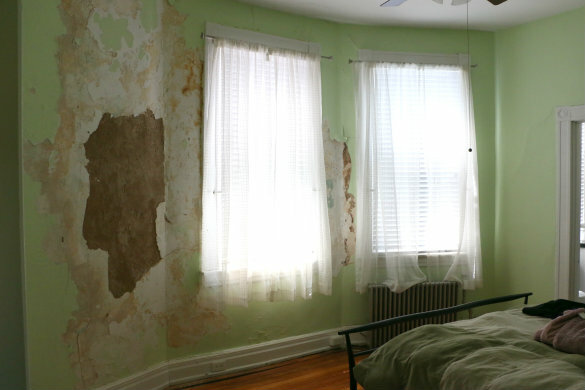 Love my 100 year old RVA home and its plaster walls. 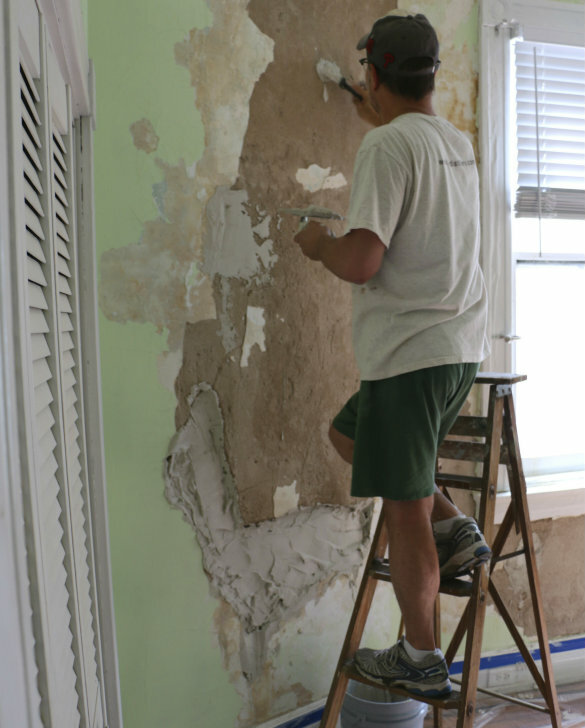 Have few small spots that need patching. Thanks for the thorough DIY tips. Might give them a try. 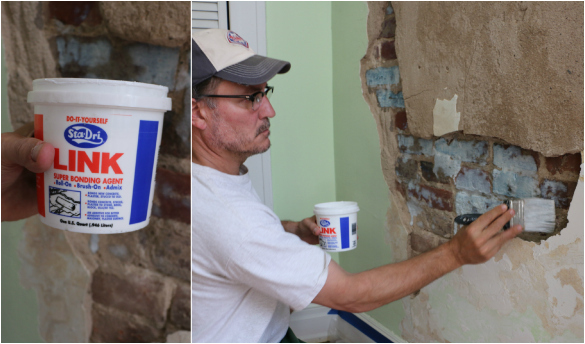 Thanks for reading the "mega" post and let us know if you have any questions once you decide to tackle your walls and also let us know how it turns out! Well everything has a price but I just do not think I could do this again so soon. There is probably dust that made it to Denver from this messy job! Thanks for the compliment! 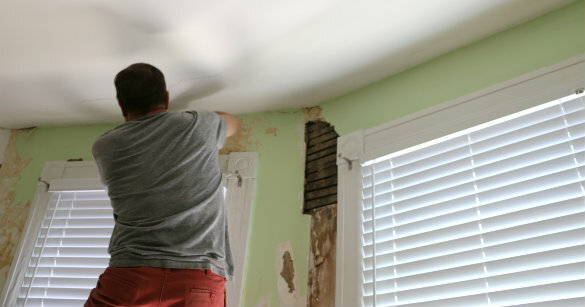 I know that some folks whose homes suffer severe plaster damage (especially if it's a ceiling collapse) choose to remove the plaster entirely and 'redo' with drywall. 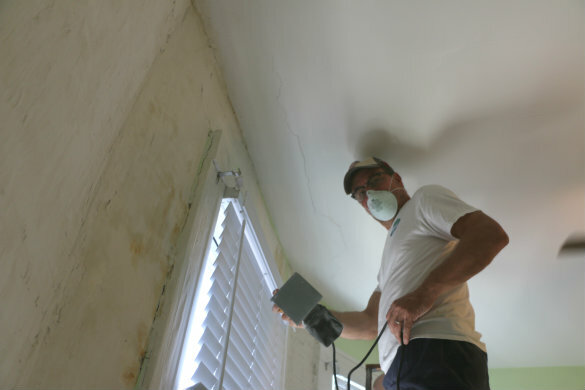 My 80+ year old home has water/leak damage to walls and ceilings and, like you, I have significant outside work that needs to be completed before I can consider inside repairs. 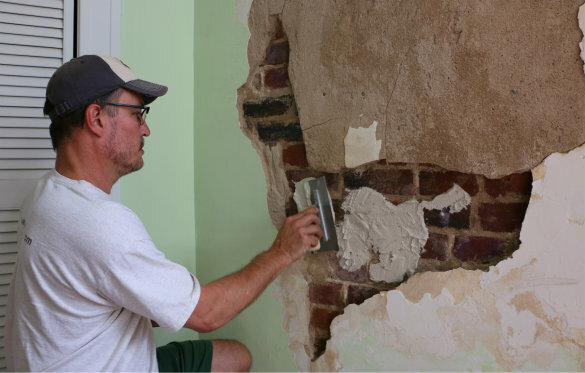 Would like to know what factors helped you decide to repair the plaster (other than authentic restoration, which is almost always preferred when it can be afforded). You've done a fantastic job and I thank you for taking the time to share!